The Harlequin opens to the general public during seasons which largely coincide with the school holidays. 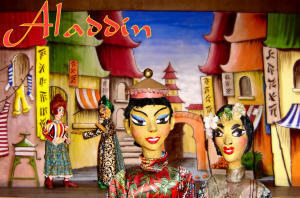 Performances usually include several items and are aimed at a family audience, and shows are daily at 3pm. Also, on one or more evenings of the week, usually at 8pm, an alternative programme features material more suitable for adults or older children and allows for longer pieces and items of more mature content. 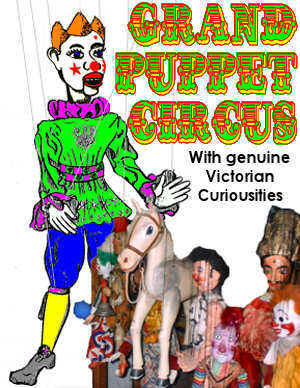 A Cavalcade of Curiosities featuring traditional marionette trickery and some actual puppets from the 19th Century. 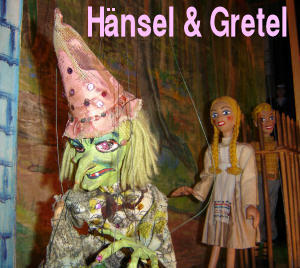 The traditional tale from the Brothers Grimm, adapted for the puppet stage by Eric Bramall. Eric Bramall's witty retelling of the Arabian Nights classic, presented in pantomime style with Widow Twankey, wicked Uncle Abanazar and the enormous Genie of the Lamp. Trained by the late, great, Eric Bramall, Chris Somerville has an International reputation for marionette manipulation. Here he demonstrates this skill without stage or scenery to assist the illusion. This popular feature concludes every performance. A poetic and colourful adaptation of the traditional fairy tale by Eric Bramall. A Victorian Palace of Varieties with a full cast of artistes of quality. We invite you to join in the singing.